If you were a car nut growing up in the 1990s, you probably know just about every variant of the Lamborghini Diablo. There was the SV, VT, the S30 Jota, even the GTR. 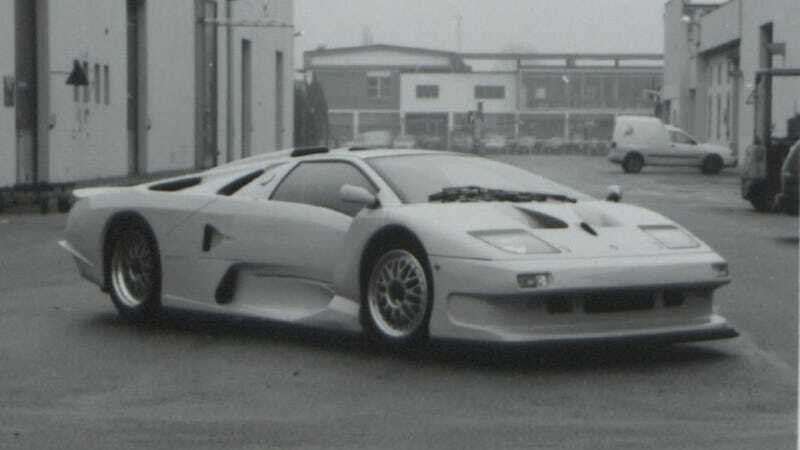 But you probably haven’t heard of an oddball called the Lamborghini 132 GT1. Everybody was getting into high-end racing in the 1990s, partially because it was so awesome, but partially because it was theoretically possible to go racing at the top level with a road-car-based racer. Few manufacturers didn’t try it out; even Ferrari (normally laser-focused on Formula One alone) attempted the oddball Ferrari F50 GT. Some even managed to have success, like McLaren and the McLaren F1 GTR, which claimed overall victory at the 24 Hours of Le Mans. Seeing all this craziness going on, Lamborghini decided to get into it, too – which was unusual, when you consider that Lamborghini didn’t have a lot of racing pedigree at the time. You’d think it’d start small, because of it. Maybe a feeder series here or there. Maybe at a lower level. Oh no. It wanted to go straight to the top. Lamborghini wanted to go to GT1. A special 6-Liter engine was created with an enlarged stroke, later another evolution of this engine would be used in the Diablo GT and the VT 6.0 production model. By using a reprogrammed injection system this engine reached 655 Bhp driving the massive 18 inch rear wheels only. All of it was going well, with Lamborghini even building a single road-going example to complement the race car, and getting the thing homologated by the FIA to make it all legal. And that’s where it pretty much stopped. It’s unclear as to why the program came to an end, though we can make a few educated guesses. The cars were built in early 1998, but by September of that year, Audi bought Lamborghini and the program was brought to a halt. By that point, the GT1 class was in its waning days, and it had already been dominated by full-on prototype racers thinly disguised as “GT” cars. It had moved on from the F1 GTRs, and gone from even the cracked-out Mercedes CLK GTR and Porsche 911 GT1 to cars like the Toyota TS020, which barely even bothered with the homologation regulations. A race car based on an actual road car was pretty much guaranteed a lack of success. Gosh it’s pretty, and it’s a sight to behold of a Lamborghini that barely ever was.